Latitude 43.382500. Longitude 4.116200. This famous cave can be found in the countryside about 1 mile to the south-west of the Cantabrian village of Santillana del Mar close to the Barrio de Herran road. The nearest town, Torrelavega, is 5 miles to the south-east, while Santander is 19 miles to the west. The cave of Altamira, close to the northern Spanish coast, is famous the world over for its rock-art, prehistoric paintings and drawings, which date back many thousands of years to the Stone-Age. At the present time the cave of Altamira is not accessible to visitors but a reproduction site has been built in the museum’s neo-cave section which is located close by, and a pretty good job they have done of it. But to return to the original cave: once through the entrance hall you arrive in a series of odd-shaped chambers and galleries that are 270 metres or 970 feet in total length and, between 2-6 metres in height. One of the chambers is called ‘the lateral’ at 30-60 feet and 8 feet in height, while the main chamber (known as The Sistine Chapel) with the ‘great ceiling’ is 6 metres or 19 feet high, but there are other chambers that are just equally as impresive. The prehistoric cave paintings and drawings or rock-art are quite astounding in that they date back thousands of years to the Paleolithic Age (The Stone Age) around 18,000-16,000 BC. The prehistoric paintings and drawings were first initiated in the Late Magdalenean period about 12,000 BC and these were added to during the Solutrean period of the Paleolithic Age approx 12,000-5,000 BC. It is believed that the cave was occupied between 14,000-12,000 BC, but at shorter periods too between 18,000-13,000 BC when the cave’s rock paintings first began to appear. On the ceiling of the great hall are the famous ‘polychrome bisons’ painted in vivid red ochre and outlined with black charcoal. In the other chambers there are many more paintings and, also drawings. More wild bison are to be seen as well as wild boar, bulls, horses and a deer that is 7 foot long, and also some quite remarkable hand paintings that were stenciled and, not forgetting the strange masked faces, that look human in appearence. In two of the chambes there are strange lines carved into the rock and some mysterious sign drawings. 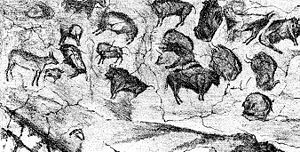 The cave of Altamira was first discovered in 1868 and, later in 1875 archaeologist Marcelino Sanz de Sautuola started to investigate and the paintings were identified and authenticated in 1879 after his daughter, Maria, alerted her father to them. During excavations a number of animal bones and stone axes were found. In 1985 the cave was made a World Heritage Site. Categories: Cave Of Altamira in Cantabria Spain, Caves / Rock Shelters | Tags: Cave of Altamira at Santillana Del Mar in Cantabria Spain | Permalink.